Back to school time means more germs! I am constantly telling my son to wash his hands which he’s pretty good at doing but during school time I have no idea how clean he’s keeping his hands. I want to keep him as germ free as possible. Germs means more colds and everything else that can cause a boogie filled noise. Boogie wipes are saline wipes that dissolves mucus caused by common colds and allergies! They are perfect to gift to teachers or send in your children’s backpack. Boogie Wipes are extra soft and come in a variety of scents. Our personal favorite is the Great Grape, but they also have Fresh Scent, Magic Menthol (perfect for cold season), Simply Unscented as well as BoogieBerry. Boogie Wipes are pediatrician recommended as a gentle and effective alternative to dry tissues. I absolutely LOVE Boogie Wipes and always keep some in the house, vehicles and of course my purse for easy access. 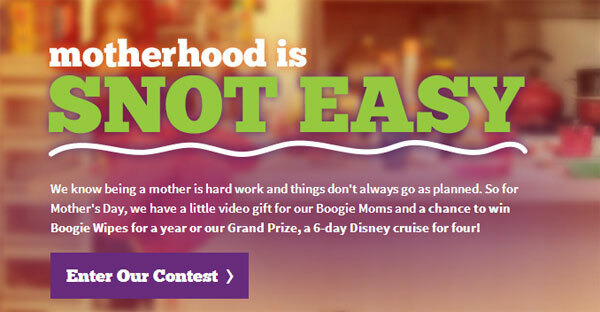 Prizes include a Cruise for the grand prize and 10 lucky Moms will win Boogie Wipes for a year!! Ends on 5/1/15Be sure you are entered for your chance to win! Join the Boogie Wipes club and get access to a $1 off coupon!! Boogie Wipes even offers Boogie Bucks on their 30 and 45 count packages registering is super easy and then you can save your Boogie Bucks for cool products. Some of the products you can redeem Boogie Bucks for include bracelets, Car Magnets, Boogs, and of course Boogie Wipes. So start saving and redeeming those Boogie Bucks today!There are even games online for the kids to play! If you are a preschool teacher or professional office be sure to check out the respective programs as well. They are great programs to be a part of! Boogie Wipes are all time favorite and can be used for a variety of things!! Make sure you like Boogie Wipes on Facebook, Twitter and Pinterest! 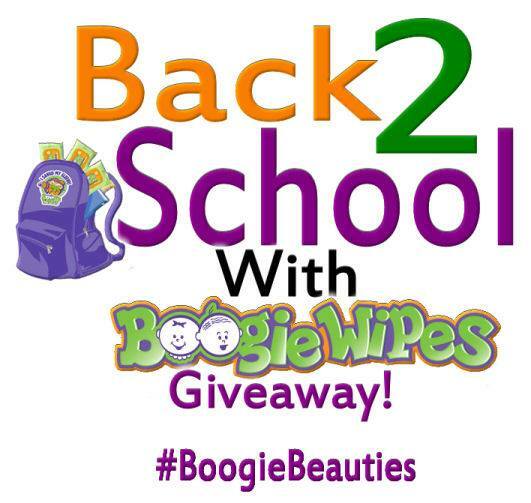 !Enter for your chance to win a Boogie Wipes Prize Basket from Boogie Wipes! Giveaway is open to US only and ends September 5, 2014 at midnight EST. Good luck! I have used them on my daughter each and every winter. They are very soothing on her nose when she has the sniffles. I love them. I use them for when my daughter is sick, her allergies are acting up,when she does a art project, we keep them in the car. Yes I have used Boogie Wipes and think it is a great product for any kind of runny nose or just cleaning the face. I would love to win this for my 2 daughters – bot if whom use this product, thanks! We love Boogie Wipes! I’d love to win this so I’ll have some extras to stash in places we need them! I have never tried Boogie Wipes before. I love Boogie Wipes, love to win! i have never tried and would love to use them when traveling. I have grandchildren and we are always wiping hands. i spend so much money on baby wipes sometimes twice a week , and i don’t have any children in diapers, its for my older 9 year old toilet tissue is so rough , so i use baby wipes for everything . especially his boogie nose !!! although i have never tried boogie wipes , i figure with a name like that , they are just what i need and cannot wait to try them !!! I have never tried Boogie Wipes but would love to. I think that my kids would like them because they are scented and I like that they have a menthol that will help during cold and flu season with stuffy noses.